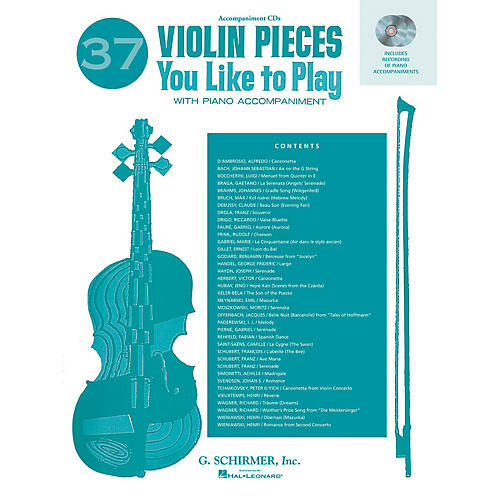 These CDs feature recordings of piano accompaniments to all 37 works from the popular folio. Contents: Canzonetta (D'Ambrosio) · Air on the G String (Bach) · Menuet from Quintet in E (Boccherini) · La Serenata (Braga) · Cradle-Song (Brahms) · Kol Nidrei (Bruch) · Beau Soir (Debussy) · Souvenir (Drdla) · Valse-Bluette (Drigo)· Aurore (Fauré) · Chanson (Friml) · La Cinquantaine (Gabriel-Marie) · Loin du Bal (Gillet) · Berceuse from Jocelyn (Godard) · Largo (Handel) · Serenade (Haydn) · Canzonetta (Herbert) · Hejre Kati (Jubay) · The Son of the Puszta (Kéler-Béla) · Mazurka (Mlynarski) · Serenata (Moszkowski) · Belle Nuit (Offenbach) · Melody (Paderewski) · Sérénade (Pierné) · Spanish Dance (Rehfeld) · Le Cygne (Saint-Saëns) · L'Abeille (Schubert, François) · Ave Maria, Serenade (Schubert, Franz) · Madrigale (Simonetti) · Romance (Svendsen) · Canzonetta (Tchaikovsky) · Réverie (Vieuxtemps) · Träume (Wagner) · Walther's Prize-Song (Wagner) · Obertass (Wieniawski). THIS ITEM DOES NOT INCLUDE THE ORIGINAL BOOK.